When I first moved to the states, around five years ago now, I was all about exploring my beautiful new home. With fifty states to explore, I set myself the daunting challenge of visiting all 50 states before I turn 30. Unfortunately, I didn't meet that goal, and you can find out why here. One of the states I did manage to visit though was Arizona. For my sister's 21st birthday, we all took a trip to Las Vegas and squeezed in a trip through Arizona to the Grand Canyon. The Grand Canyon is one of the most incredible places on earth and well worth a visit to the state of Arizona. We however didn't do much else in Arizona due to the short amount of time we had. 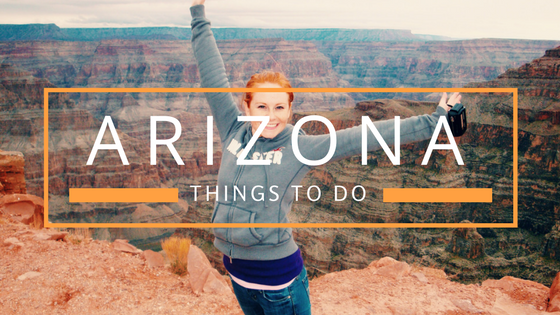 My friend, Jill, from Let's Travel Family has shared her favorite things to do in Arizona below. Arizona is a very diverse state. With desert cacti to pine tree forests, it is a sight to see and experience. It has large cities with major airports allowing for a smooth arrival. Taking a road trip to some iconic destinations such as the Grand Canyon and Four Corner’s Monument is a must-do activity. Read on to learn about our top 5 things to do in Arizona. Did you know that you can stand in 4 states at once? If you take out a map of the United States and look for Arizona, you will see that the Northeast corner intersects with Colorado, New Mexico, and Utah. This is the only place in the country that four states connect this way! Our family drove out of our way so that we could stop by the Four Corner’s Monument. The visitor center is open year-round and is a great place to stop during a road trip across the Southwest. We visited on our way to the Grand Canyon to grab a picture and stand in 4 states at once. Do you have the ambition to check off a huge bucket list item? Are you ready for adventure? Then hiking the Grand Canyon should top your list of things that you must do this year. The Grand Canyon National Park is in Northern Arizona about 80 miles West of Flagstaff. It’s not a day-trip National Park, as it is many miles away from major cities. I recommend booking your accommodations at least six months to 1 year in advance if you want to visit during the busy summer season. Planning a hike down into the Grand Canyon can be exciting. Just be sure to read about the recommendations for ages and abilities of anyone who will be hiking with you, especially children. The many hiking trails allow for a partial decent and then return to the South Rim. It is understood that there is no easy hiking trail into the Grand Canyon. If you would prefer an easy hike, then check out the rim trails along the upper rim of the canyon. They have fantastic views and are easy to access. Now, if you’d like to hike all the way into the Grand Canyon, you will need to be very well prepared to camp overnight once there, and you’ll need a backcountry pass. It’s too long of a hike to go all the way in and out in one day. When camping in Arizona, the temperature can be much colder than you realize. The temperatures in most of the state drop into a very comfortable range once the sun sets, allowing for a great evening to camp out. If you choose to camp near the Grand Canyon, then be prepared for even colder temperatures. You will be between 7,000 and 8,000 feet above sea level. I knew this when planning our family trip to the Grand Canyon, but I did not completely comprehend how different the Grand Canyon area is than southern Arizona. Pine trees lined the roads, the air was crisp and cool in October, and there was not one cactus at our campsite. If you hope to camp inside Grand Canyon National Park, be sure to take the size of your RV into consideration. Tents and RVs or campers that are 30 feet long or less can camp inside the National Park. Reservations are taken at Mather Campground near the South Rim entrance, but understand that there are no hookups. You will be dry camping without electricity or water. If you’d like to have hookups, then check out a private campground such as Trailer Village inside Grand Canyon Village. Have you ever hiked in a dessert? Do you know which cacti to avoid getting close to and which you can touch? Before visiting Arizona, I had never been near a cactus that grew in nature. It was such a thrill to see the saguaro cacti lining the southern facing slope of the mountains while driving to Southern Arizona. The famous Saguaro cacti is an icon of the American Desert. It only grows in the Sonoran Desert and between 0-4,000 feet above sea level. It is, however, not the only cacti that you will see while exploring Arizona. The prickly pear, jumping cholla, and hedgehog cacti are a few more cacti to see while visiting Arizona. Grab a guide or great book and take it with you on a hike to help you identify these amazing plants. If you are looking to get out of the heat for a bit, check out the Arizona Science Center in Pheonix, AZ. We found the Science Center was great for all ages. With interactive exhibits that interested my young children, to highly educational exhibits that kept the adults in our group intrigued. Or better yet, enjoy learning alongside one another. The Forces of Nature exhibit was a fun and exciting experience for our entire group. We stood in The Immersion Theater and felt the wind, rain, and rumbling of thunder during a simulated thunderstorm. It took us by surprise that it rained on us inside! We also enjoyed learning how a person could lay on a bed of nails in the Get Charged Up exhibit. It was a great experience for everyone in our group as we all took turns lying on a bed of nails. Arizona is a fantastic place to visit throughout the year. Many people enjoy visiting Southern Arizona in the winter months with the warm temperatures, while much of the rest of the United States can be very cold. If you’d like to see the world famous Grand Canyon, be sure to plan a trip in late Spring or early Fall for the best weather and smaller crowds. Jill is a family travel writer, full-time traveler, wife, and mother to 4 kiddos. She is always seeking new experiences and working to inspire others to travel. Jill is the founder and editor of Let’s Travel Family, a family travel blog.